Opdyke (population 254) is a town located in southeastern Illinois on Illinois Route 142 about eight miles southeast of Mt. Vernon. This places Opdyke in eastern Jefferson County. The Louisville Nashville Railroad once ran tracks through town. A branch of the Auxier Creek also flows through Opdyke. The village was platted in 1871 along the St. Louis and Southeastern Railroad line. The village was named after a New York banker named George Opdyke who was an investor in the railroad. Not a lot of information is known about the Opdyke school history. It is known Opdyke supported a high school for many years. Opdyke does still apparently support its own elementary schools as it still hosts an elementary and middle school in town. This is a cooperative effort with its neighbor to the southeast, Belle Rive. 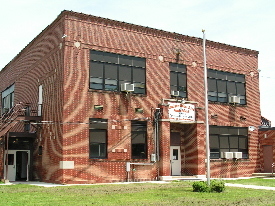 It is likely the students who graduagte from Opdyke-Belle Rive Grade School go on to attend high school in nearby Mt. Vernon. Opdyke High School likely closed in the late 1940s as the last mention of their athletic success on the IHSA web site (www.ihsa.org) is in boys basketball in 1948. 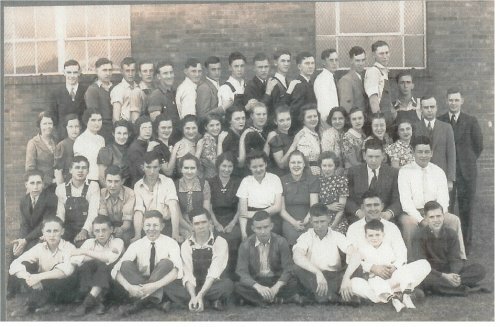 If you have any information on the history of Opdyke and its school system please write to us at ihsgdwebsite@comcast.net . A link to the current Opdyke - Belle RIve School website can be viewed at http://opdykebelle5.sharpschool.net/ . Opdyke High School definately offered boys basketball. It is thought that baseball and track were also offered. We are hopeful someone will share this information with us before it is lost forever. The Opdyke High School boys basketball team won two District titles during its existence. Unfortunately the school records and coach's names are not available. The years of the titles won are listed below. Several scores involving Opdyke High School in the IHSA State Tournament were located on a website titled "Illinois Postseason Basketball Scores." They are listed below as well. There was more than just athletics offered at Opdyke High School. As you can see by the photo to the right supplied by Jennie Richardson, band was one of the opportunities afforded the kids of Opdyke. 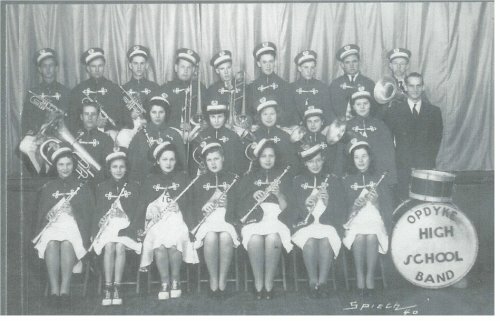 We are certain other activities such as choir, FFA, FHA, plays, and banquets all added to the experience of attending Opdyke High School.